Notre Dame has taken another step forward in joining the elite programs such as Ohio State, Alabama, and Clemson. In a season-long process, Notre Dame has yet again dominated against an inferior opponent. Never before in the Brian Kelly era, and probably not since the Lou Holtz era has Notre Dame been able to line up and dominate opposing teams on a weekly basis. The Irish have often been accused of playing down to their opposition, but so far this season, all four of their wins were by at least 20 points and their lone loss was by a single point against what is looking like a top 5 Georgia team that currently look like the SEC East favorites and a dark horse for their first playoff appearance. Notre Dame made a statement by scoring 45 points before halftime against a gritty Miami of Ohio team and finishing with their first 50+ performance. Despite not having a sharp game defensively, Notre Dame was able to display a clear difference in class and athleticism between themselves and their MAC opponents all the while rotating their squad and resting several players. This is how elite programs are built and depth is developed, and Notre Dame took another step toward joining college football’s elite. Can Adams get some respect? Adams finished the day with 159 yards on eight carries for two touchdowns and a 19.9 average yards per run. All this was done in the first quarter before leaving on a gimpy knee following an awkward tackle by two Miami of Ohio defenders. Adams who was already one of Notre Dame’s most prolific runners heading into his junior season, has elevated his game to another level. Adams has 658 yards on the season on 73 carries for a 9.0 average and 4 touchdowns. Adams is also threatening to break George Gipp’s record of 8.1 yards per carry on the season which would put him in rarefied air. The only thing that has slowed down Adams this season aside from the Georgia front seven has been nagging injuries which has limited Adams to single-digit carries in consecutive games. If Adams stay healthy against UNC on the road next weekend, the bye week comes in a very opportune time for him to rest up and recover before playing a USC team at home that is looking to rebound. If Adams can stay healthy and contribute close to 200 carries, he deserves to be a Heisman honorable mention and regarded as one of the nation’s top running backs. The first year quarterback continued to struggle as a passer early in this game. Wimbush opened the game connecting on only one of his first seven passes before finishing 7 of 18 on the night. Despite the passing struggles, Chip Long did the right thing by continuing to call passing plays his way. With Dexter Williams out for the game and Josh Adams and Tony Jones Jr. getting banged up early and nursing lingering injuries, it left Deon McIntosh as the lone healthy ball carrier. While McIntosh did well carrying the load for much of the game, it was clearly evident with his slight frame that he was not capable of being an every down back as he was easily stopped on contact and struggled to gain extra yardage after contact. 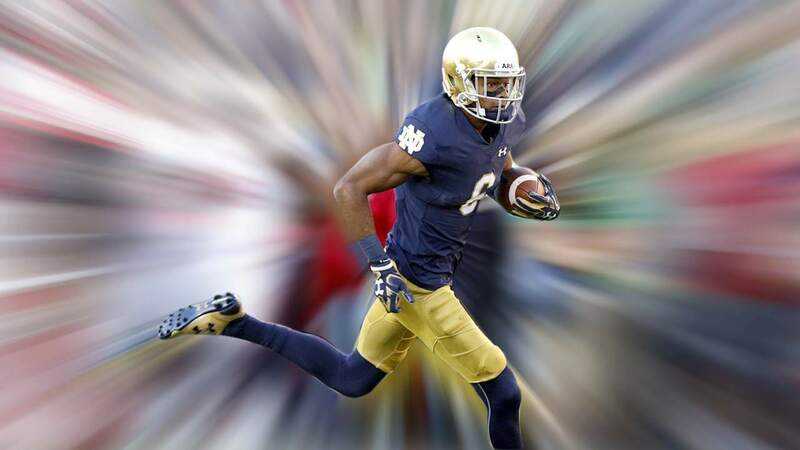 With McIntosh amounting to little more than a change-of-pace back, it was upon Wimbush and the passing game to carry the offense. Wimbush did eventually get in a groove in the second quarter going 6 of 11 for a still pedestrian 55% completion percentage, but also drew a pair of pass interference penalties to keep drives moving. Regardless of the performance, Wimbush finished with three passing touchdowns on the day and one on the ground with no turnovers. The staff has plenty of film to analyze this week as Wimbush failed to identify several open receivers and needs to correct his faulty mechanics as he missed several wide open targets. On a side note, a positive development on the day for the passing game was how good Ian Book looked running the second team offense. Book finished 3 of 5 passing with the two incompletions due to drops where he put the ball on the money. Book looked good when reading the game and was also impressive running the football as well finishing with 37 yards on three carries with a long of 26. While Book may not have the athleticism to supplant Wimbush, his sharpness could give Kelly something to think about if Wimbush continues to struggle in a big game and the offense needs a spark to win a close game. Book will definitely keep things interesting. ND should probably have opened the game giving Brandon Wimbush easy completions to start with, just as they did in the Michigan State game to help him warm up and get in a proper rhythm. Chip Long and Brian Kelly probably thought that wasn’t necessary after Michigan State, but it probably would have helped. Considering the opposition, I was ok with the play calling, plus Wimbush needs to run those tougher plays against inferior opponents. The main thing is that he has plenty of tape to work off of as Long and Rees have plenty of material to teach from. Also, some of those plays weren’t tough as he missed some wide open receivers (the bubble screen was probably the most glaring). Those plays were necessary as they exploited his poor mechanics which need to be addressed.